Going to a video store in the 1980s was always a treat. Those who remember these journeys for cinematic fun should remember that movies look a lot different than they do now. 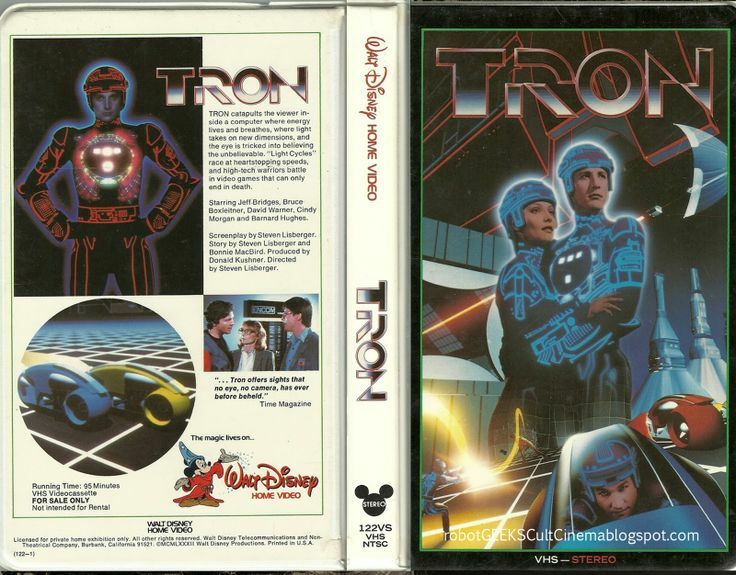 One of my absolute faves was the Original Disney Clam shell VHS release of TRON. I can still see it on the shelf, weather beaten, sun bleached but powerful as hell. I wanted to be on that Grid more than anything!Disney did a great job with cover graphics and back cover information! TRON Original Disney VHS Clam Shell Release! The attention to detail even on the tape itself was amazing and a lost art these days even on some DVDs and Blu-Rays which a lot of times take shortcuts with disk graphics! Check out the fun tape graphics Disney included on their VHS tapes! The Tron Arcade Game (See Below) was legendary at the time but it was this one video tape that kept me coming back! Come on..how about Clam Shell DVD or Blu-Rays! Get on it! Ill buy em! Transmission has been interrupted by a Recognizer in the area..Till next time Heroes! Over already? Want More? Lets chat on Twitter @charlton_hero follow the conversation at #SuperHeroSatellite..